SlimJet – надежный веб-браузер с изящным интерфейсом, делает посещение сайтов удобным и безопасным, а также предоставляет множество полезных функций. Браузер обладает улучшенной интеграцией с популярным социальными сетями и сервисами, такими как Twitter, Google Plus, Blogger, WordPress, Gmail, Hotmail и StumbleUpon. If you enjoy the speed and reliability of Google Chrome but don’t like its lack of customizability and options, if you would like to have a browser which can do a lot more things in addition to opening web sites passively upon your clicks, if you would like to become more productive when you are doing online research, SlimJet is the perfect choice for you. 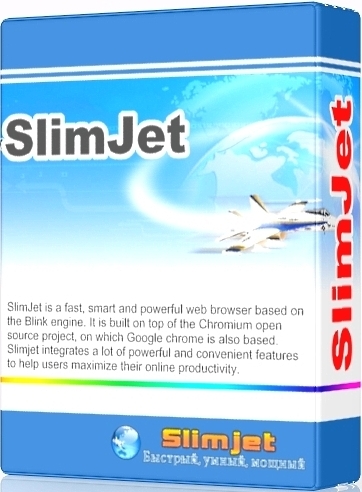 SlimJet is based on the Chromium open-source project. On top of that, SlimJet integrates a lot of smart and convenient features so that you can get more done in much less time without taking the pain to hunt for external plugins. SlimJet also adds many options and settings so that you customize the browser appearance and behavior to best suit your own personal preference.